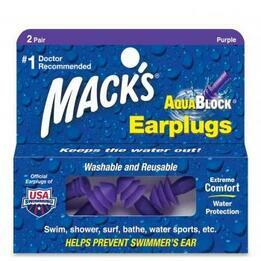 Mack's AquaBlock Reusable Swimming Earplugs are a good quality swimming ear plug at an economical price. These swimming ear plugs are made of pre-molded silicone rubber -- a soft material that, combined with these ear plugs' triple-flange design, makes for a very comfortable fit and an excellent seal against water. Mack's AquaBlock ear plugs are reusable, so one pair of these great plugs can potentially last through a whole swimming season with proper care and the occasional cleaning in warm, soapy water. And as an added value, these AquaBlock Earplugs come two pairs to a pack! Available in clear and purple. Carry case also included. Mack's AquaBlock Reusable Swimming Ear Plugs (2 Pairs)5Bob McLellanSeptember 11, 2018I've never given anything in my life 5 stars - go figure. This is my 3d set of Mack's ear plugs over the past 5 years or so. I don't wear them out I usually give them away to friends or family. The soft foam is what stands them apart, ear comfort for hours at a time is what I need. Mack's AquaBlock Reusable Swimming Ear Plugs (2 Pairs)5The Oasis RVA Flotation Therapy in RichmondApril 28, 2016We use this item as our give away ear plug for all our clients. You will have your ears under water for 90 minutes straight with us, and we've never gotten a complaint from anyone. We usually buy 100 boxes at a time to save money. Mack's AquaBlock Reusable Swimming Ear Plugs (2 Pairs)5Gale TeschendorfMarch 8, 2016I have tried at least a half dozen. Mack's AquaBlock Reusable Swimming Ear Plugs (2 Pairs)5Grace, New JerseyFebruary 20, 2016I have been using these plugs for several years. I cannot tolerate water in my ears. I use them daily for showering plus swimming in the summer time. My little girl, age 11, uses them now too. These plug do keep out the water. Mack's AquaBlock Reusable Swimming Ear Plugs (2 Pairs)5Debbie GuindonDecember 6, 2015These are the only earplugs that completely block out all noise! My husband clears his throat a lot, and sometimes I can't tolerate it. I just slip these in and no more noise!!! Mack's AquaBlock Reusable Swimming Ear Plugs (2 Pairs)5GraceJune 17, 2015I have used several different kinds of ear plugs since I cannot take a shower without ear plugs due to water getting in my ears and causing pain. When I found these Aqua Blocks I was totally impressed. I have FINALLY found a pretty tight sealed ear plug. I have looked high and low for such a product and I finally found Macks. In addition, I had an auto accident on Oct 25, 2015 and I sustained a mTBI (mild Traumatic Brain Injury). These plugs are wonderful for sealing out the noise that frequently give me a headache and head pain and pressure. The little girl, age 10, down the street from us just sustained a concussion as well during her soccer game. I immediately gave her one case of these plugs since she cannot take the noise either. Worked like a charm! I ordered five cases. I am about to order again since I already lost two pair of them. Keep up the GREAT work Macks! Mack's AquaBlock Reusable Swimming Ear Plugs (2 Pairs)5Lois BorgenichtJuly 30, 2012Swimmer's ear, no more! These are the best, ever. Soft as they are, my ears do feel a little sensitive after a long swim. Mack's AquaBlock Reusable Swimming Ear Plugs (2 Pairs)5Roy WindmullerFebruary 2, 2012The shipping time was amazing! The product does all it's suppose to do, thanks. Mack's AquaBlock Reusable Swimming Ear Plugs (2 Pairs)5DianeMarch 15, 2011I have tried all the ear plugs and these aqua blocks are the best. Helps keep snoring sounds bearable. I tried another light blue swimmers ear plug and they were awful, wouldn't stay in the ear. The purple Macks are the best.